You only need to hear the Haunted Mansion wolf howl once and you’ll never forget it. Its long, mournful wail is as iconic as Disney park sound effects get — as memorable as the whistle of the steam train, the blast from the Riverboat, the ridiculous honk of the monorail. It’s really more of a dog howl than a wolf howl. We know this because we can see the dog howling in the graveyard scene — a nightmare creature of bones and ectoplasm, tilting his head towards a moon that never rises. But for long-time visitors of the Magic Kingdom, that Haunted Mansion wolf howl was much more famous outside the ride than in. The Haunted Mansion sits on a secluded bank of the Rivers of America, just downstream from an unassuming buoy labeled “Howling Dog Bend.” And ever since the park’s very first years, travelers on the Liberty Square Riverboat, the Mike Fink Keelboats, or the long-forgotten Daisy Duck Happytime Canoes would be treated to that baleful Haunted Mansion wolf howl every 16 seconds. Check out this vintage trip aboard the Riverboat, back when it was known as the Richard F. Irvine (whoever he was). The first clear Haunted Mansion wolf howl sounds off at 8:46, blasting again 16 seconds later. There’s an edit just before the Steamboat comes around Howling Dog Bend that I think chops into a third occurrence of the howl. Pity the poor fools in the Haunted Mansion line. The outdoor wolf howl is much more prominent and distinct than the graveyard dog howl inside the ride. There’s no Grim Grinning Ghosts or obnoxious Thurl Ravenscroft to drown it out. But for a long time now, the unseen outdoor wolf has ceased its howling. I’ve watched several Riverboat POV rides on YouTube now. More than any one person should be subjected to. Almost more than any sane person can stand. And the Haunted Mansion wolf howl appears in nary a one. I even ventured onto Tom Sawyer Island to confirm it for myself. Behold the sound of silence. 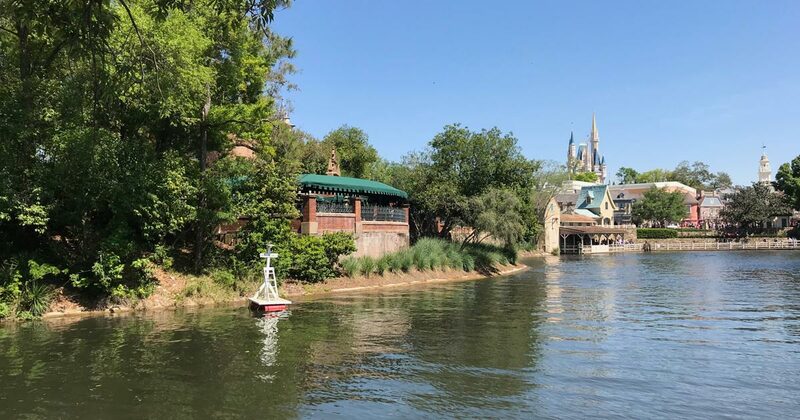 Yet that happy little buoy still bobs in the Rivers of America, blindly labeling this section as Howling Dog Bend. As best I can tell, the Haunted Mansion wolf howl sound effect disappeared around 2011, about the same time that they added the outdoor queue enhancements. Perhaps Imagineers were worried that people wouldn’t hear Madame Leota’s quiz show rhymes or the tambourine noise on the bookcase with that dog howling all the time. Or maybe somebody just accidentally cut the speaker wire. In any case, the Magic Kingdom has lost one of its great memorable sound effects. Unless, of course, you just ride the ride. Either way, I’m just hoping this doesn’t spell doom for the smoking cannons on top of Pirates of the Caribbean. This entry was posted in Lost and Abandoned Disney Details and tagged Haunted Mansion, Liberty Belle, Liberty Square, Magic Kingdom, Rivers of America, Tom Sawyer's Island, Walt Disney World. Bookmark the permalink. I distinctly remember hearing it in December 2012. But it’s always possible my imagination was just filling it in. When I was a kid, I was TERRIFIED of the Haunted Mansion. I can’t explain why but I was. When I was very small, like in the mid 90s, I swear I remember hearing that wolf howl any time we got even remotely close to the mansion area. I could hear it all the way across in frontierland it felt like sometimes. As I got older I honestly thought maybe I’d imagined it, but it’s nice to see I wasn’t crazy. I swear I heard it in 2015. Although, I was by the gates of the Mansion, so it probably seemed louder there. Oh man! I hope this is not the case! I always got a kick out of hearing the howl in the early misty morning at the Polynesian. It’s really unfortunate. It wasn’t something that you notice immediately when it’s not there. But it is something that does stick in your mind when it is. From what I recall the volume for the track was lowered drastically when the interactive queue was installed, however it could still be heard when you were in line. Most likely the speaker blew out and hasn’t been replaced. The actual audio is part of the river/train audio bank and NOT part of the Mansion audio which is stored in-house. It was clearly meant to tie in the Riverboat to the Haunted Mansion. But 8 years is a long time for a blown out speaker to sit out there. Yea well, it’s a long time for a Yeti to just sit there not moving too. But we all know how that goes. I remember being able to hear the wolf howl outside the park when I stood on the Contemporary roof. Of course it’s been years since being able to get to that roof as well. You can get outside onto the Bay Lake Tower bridge… but still no wolf howl.